The Brevard College Men’s Soccer team (3-8-0, 2-5-0) won a closely fought 2-1 victory over host Averett (2-9-1, 0-5-1). The win comes on the heels of a neutral site win over conference foe Berea. Brevard College’s move to DIII positions Brevard with schools similar in size and resources, in addition to aligning with Brevard College’s mission, and to enhance the student experience. 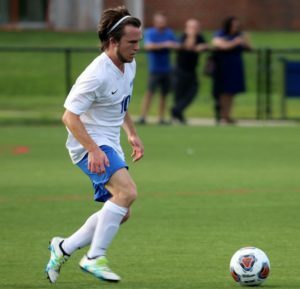 Brevard College’s Brock Tuttle scored both the Tornados goals in the which also featured stout defensive play down the stretch of the contest. Tuttle opened the scoring with an unassisted goal, as the senior from Harrisburg, N.C., dribbled into the box, then blasted a shot past Averett’s goalkeeper to find the back of the net. The second goal by Tuttle came as the result of a double assist by teammates Bry’Kendrick Moore and Thomas Kennedy. Moore dropped a pass back to Kennedy who brilliantly played it off on a one-touch to Tuttle who handled the rest to score again for the Tornados. With Brevard leading 2-0, Averett’s Sean Dunbar scored the home team’s only goal to cut the lead to 2-1. Brevard College would hold on from there however, holding the Cougars scoreless for the final 60 minutes of the match. Goalkeeper Patrick Hall registered five saves en route to the win, including two saves in the second half to help preserve the victory.